I don't really follow the argument about the school bus axle not handling the weight of an RV conversion. I would think 65 kids and the seats weigh more than a finished conversion with a few people. Do any of your conversions go over the GVWR of the bus? I don't have one, yet, but want to convert one some day. The potential insurance issues are a bit of concern. I agree. If you build it within the weight it should not have any bearing on what's inside. I plan on weighing mine before and after with a balanced build approach. That being said, all those "tiny house" shows that depict the extreme double decker built of solid wood and steal on a short bus frame... Probably aren't helping the vast majority of people staying comfortably within the gvrr. IMHO. Agreed, I would even bet that the completed conversion probably weighs less than a full busload of people. that's a sale gimmick. plenty of insurers other than AIS insure school bus conversions. they are just trying to sell you a policy with fear of cancellation. the problem most people have with insurance is their own words. 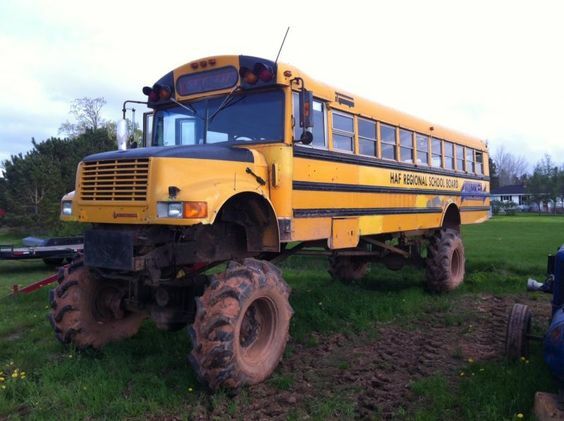 when you tell your agent you bought a schoolbus, they assume you are transporting students for money. that makes you commercial. the agent stops listening at the word "bus" and they either can or can't help you. go in and tell your agent you bought an rv. that is what you will register it as. they will be happy to sell you an rv policy. and for the most part, its just a liability policy that you are seeking. the insurance company will not pay for your bus, only damages you cause to others. thats easy money for insurance company. This is patently wrong. One glance at the photo of a school bus accompanying this statement disproves the statement. But average citizens have so little understanding of even basic mechanical physics, that all comprehension eludes them. I suspect this allegation is a blatant pretext -- it is not even a euphemism, nor an error. By citing something that sounds technical -- however much out of the blue -- they avoid saying that school buses are often converted and driven by incompetent hippies on bailing-wire budgets, which is true, and is the real reason for the nasty losses. What to do about the bailing-wire-hippie problem? Self-policing. And this forum is the perfect place for it. im guessing part of what they say is true.. more accidents yes..
big coaches are more expensive so people likely take a care to make sure everything is 100% secure..
again it seems the group here is concious of tying things down or mnounting in such a way that the bus is balanced and ready to go... but this is only a small fraction of skoolies out there..
Quite so, and we on this board ought to do all we can to guide and tutor any questionable skoolie owners we encounter elsewhere. I think raising the center of gravity plays a big part in rollovers. Roof-top decks made of pressure treated lumber, suspended cabinets, etc. contribute to change in tipping point. Improperly balanced or baffled water tanks can shift large amounts of weight, very quickly. Schoolbus drivers also undergo rigorous vetting of driving infractions and undergo training. They also passed CDL driving course test. No idea what they are talking about axle width- how could it be wider? They seem to be comparing it to the 102" wide coaches. But if the weight is good, and the center of gravity is kept low... It was originally designed to have that width axle. I agree adding all that weight to a roof deck, and even raising the roof can drastically change the center of gravity.